I think so. It claims to be independent from the underlying 3D framework, so i don't see a reason why it shouldn't work in combination with jPCT. Maybe some transformations between the coordinate systems of both engines are required, but i think that's the only hurdle. I've ported the basic demo to jPCT by writting my own implementation of jBullet's IGL-interface (which is fine to try things out but not a good idea to continue development on that base, because it's bound too much to the way how OpenGL works. That's why i'm currently not offering it for download). The only stage where i had to make a transition was when applying the OpenGL-alike transformation matrix to jPCT created Object3Ds. I had to split it into translation and rotation. The translation (as well as all other position related stuff) requires a small transformation into jPCT's coordinate system by doing x,y,z -> x,-y,-z. 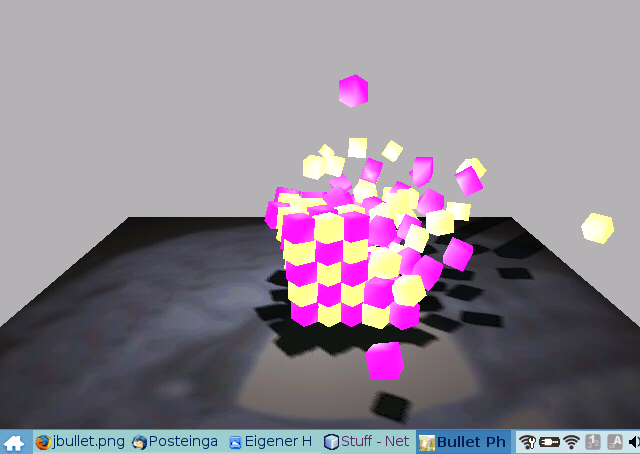 The rotational part can be set directly into a jPCT-matrix with setDump(). BTW: Fully developed on Asus EEEPC...it's quite convenient when using Netbeans (and impossible when using Eclipse). I would rather post the sources for the port than to dig deeper in jBullet, which is what i would have to do to make it work in an applet of my own. Actually, you just have to learn how jBullet works. The glue between jPCT and jBullet is very thin, and it should be possible to derive that from the sources. I'll post them later tomorrow. And here it comes. But please keep in mind that especially JPCTGL.java does some strange things to make jPCT behave like the state machine that OpenGL is. Normally, one wouldn't write a jPCT based application in that way. * the use of this software. * appreciated but is not required. * misrepresented as being the original software. * BasicDemo is good starting point for learning the code base and porting. // The gluCylinder subroutine draws a cylinder that is oriented along the z axis. // The base of the cylinder is placed at z = 0; the top of the cylinder is placed at z=height. // Like a sphere, the cylinder is subdivided around the z axis into slices and along the z axis into stacks.